Here are just a few reminders for you. Our 2015 Season Launch Party is fast approaching! Join in on an evening of fun and find out about training opportunities, practices, upcoming races, and upcoming events. Get together with old friends and make new ones! There will also be delicious appetizers!!! There will be a prize for the best Cinco de Mayo costume, raffle prizes, a trivia contest and much more! Please pass this message along to your fellow paddlers. We are pleased to offer yoga classes to all of our members. It will take place every Monday from 6:30pm to 7:30pm, running until the end of May. Please arrive 10 minutes early. It will take place in the basement of Burton Avenue United Church, located at 37 Burton Avenue in Barrie (just off Essa Road). The cost is a suggested minimum donation of $5 per session, which will be split between the church for the use of their facilities and the club. We still have a few spaces left on our beginner and competitive teams. Registration and fees are due May 1st! For anyone requiring or interested in receiving a new team jersey, please note your orders are due May 8th. 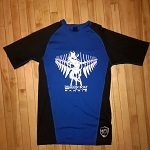 Please let your team captain know your desired size, and/or order via our website at http://dragonboatbarrie.com/swag/ . Cost is $35.